Ninth grade Lesson What is a Plot W? : Lessons from "Everybody Knows Tobie"
Review -- What is a Plot W? What is a Plot W? : Lessons from "Everybody Knows Tobie"
SWBAT explain the PLOT W by examining a text featuring this plot device, "Everybody Knows Tobie." Students enjoy writing with the element of surprise when they use a Plot W narrative structure. The following image (link) comes to us from a blog about dramatic structure (link to blog). 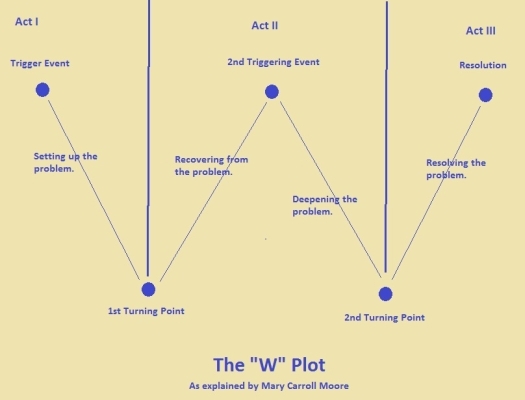 In this image, we can see that an alternative to a standard plot line (exposition, rising action, climax, falling action, resolution) can be in a Plot W, which calls for two reversals along the way. Students find this technique to be an intriguing way of structuring their events (W.9-10.3c) because they like to have a trick of their sleeves, so to speak, and to imagine pulling the reader along. In addition, I have noticed over the years, that this lesson gets students to become better readers of fiction, as they end up reading more carefully for the structure of a text, especially noting how author use flashback or order time in a way that a makes the story more interesting (RL.9-10.5). Yes, the students have long been able to identify a flashback, for example, but I see this lesson as helping students to get inside the writer's head a bit better, on the production end, to consider how he or she made the choices of where and how to sequence the scenes. - How can you incorporate reversals in your story? - When we read the story "Everybody Knows Tobie," listen carefully for times when the narrator's views of himself or his situation seem to be improving (going up in the plot W) or degrading (going down in the plot W). The story deals with the insidious nature of a town ruled by de facto racism (RL.9-10.2). Both the narrator and Tobie, his brother, want to be accepted by the white townsmen in town for both personal reasons and for reasons (RL.9-10.3)of business (paper route). This is all typified by the question of whether nor not they should be allowed to get their hair cut at Mr. Brewer's barbershop. In the end, the narrator is allowed to do this, but really, it's a hollow victory (RL.9-10.5) and a somewhat ironic connection to the plot W (ends on a high note, but it's ironically sort of bad, anyway). Today, the students will read the story, and tomorrow, we will discuss its relation to the Plot W as well as the manner in which the writer uses dialogue to move the story forward. - How do you feel about the ending? Is it a victory or not? - How does the writer use the Plot W to create a powerful story? **For homework, the students can begin drafting their larger narratives. They are ready to begin to graph out what their characters will do now that they have been fleshed out and now that we have discussed plot in class!